Oh, Heaven never really had any mercy, Castiel. You know that. I am saving Heaven. I am saving our kind. I am saving the world. Dumah was one of the last remaining nine angels in Heaven. 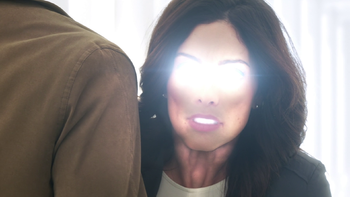 After the invasion of the Cosmic Entity, she took control of Heaven, imprisoning Naomi, and reshaped it to her will, ultimately leading to her death at Castiel's hands. Castiel and Dumah meet at the Playground, and Castiel asks if the angels have Jack locked away. Dumah replies that Jack is not in Heaven, and if he were, he would be put to work rather than imprisoned. When Castiel is confused by what she means, Dumah reveals that after the fall, their numbers have greatly diminished and the angels are going extinct, as no others have been made since the dawn of creation. The angels plan to use Jack, whether he wants to or not, to make more angels. Castiel argues that Jack is not a slave or a thing to be used as a pet. Two other angels appear, revealing that Dumah lured Castiel in a trap to be caught and used by Heaven to get Jack. Dumah asks Castiel to come with them, but Castiel attacks all three, and a fight ensues until Dumah is able to get the advantage and hold Castiel at blade point. However, Lucifer makes his presence known and tells Dumah to drop her blade. Dumah does not comply until Lucifer begins to power up; upon seeing his red eyes, Dumah and the other angels flee back to Heaven. Dumah and two other angels meet with Lucifer at the playground. Lucifer tells Dumah the angels need him, and in response, Dumah orders the other angels to kill Lucifer. Lucifer stops Dumah, telling her she can't kill him, even in his weakened state. Dumah replies that they can still try, repeatedly, to do so. Lucifer then attempts to appeal by revealing he can create more angels, if he is declared ruler of Heaven, which causes Dumah to laugh. Dumah stops laughing when Lucifer reveals he can also return their wings. Dumah is later seen in Heaven's Throne Room kneeling before Lucifer with a group of angels. Entering the throne room in the midst of an argument between Lucifer and Jo, Dumah deflects Lucifer's attempt to draw her into their debate, telling him couples issues aren't her area. When Lucifer asks her about the search for his son, Dumah tells that the few angels they can spare are scanning the planet, but have not found anything, revealing that they do not have the manpower for a wider search. When Lucifer reiterates finding him is a priority, and flashes his red eyes, Dumah agrees and leaves the throne room. When Castiel enters Heaven's Throne Room, Dumah and two other angels enter and listen to his explanation of all the cataclysmic events unfolding on Earth, including the fact that Gabriel is alive. A power surge occurs in the room and Dumah states that they may probably be able to help each other. After leaving Castiel in the room for an indeterminable period of time, Dumah returns and asks him to find Gabriel and return him to Heaven in exchange for their help. Castiel explains that he was hoping that they knew where he is or would at least spare a few angels to help him, but before Castiel can continue he gets interrupted by Naomi telling him that they can't help him. She explains that Dumah and the other angels can't leave because they're the only things keeping Heaven operational. The Cosmic Entity takes over Dumah. Upon entering Heaven after hearing the the distress call on angel radio, Castiel finds Dumah unconscious in a corridor. When she comes to, she explains to Castiel that everything went black when she came into contact with the Entity. Dumah then accompanies Castiel in his search for Jack. Entering Jack's abandoned personal Heaven, she and Castiel are met by Naomi, who explains that the Cosmic Entity has come to lay claim on Jack's soul. She intends to give it what it wants, but is soon taken over by the Entity causing Castiel and Dumah to flee. Finding their way to Kelly Kline's personal Heaven, Dumah reveals that the Entity has possessed her and intends to take Jack until Castiel makes a deal to trade his life to keep Jack from the Empty. The Entity agrees to the terms and leaves Dumah's vessel, leaving Dumah confused as to what had happened to her. Dumah is killed by Castiel after threatening John and Mary Winchester's afterlife. Arriving at the Playground in hopes of speaking with Naomi about Mary Winchester, Castiel is instead met by Dumah, who confirms that Mary is dead and in Heaven with John. She tells Castiel that Mary is "complete" and that her death was quick and painless, allowing him entry into Heaven to witness Mary's personal Heaven to confirm what she has told him. Dumah is revealed to have become Heaven's new leader since the Cosmic Entity invaded. She tells Castiel that the angels lost confidence in Naomi and had her imprisoned. With her new power, Dumah began reshaping Heaven to be a more merciless and unforgiving place and manipulates Jack Kline to do her bidding. After discovering the truth, Castiel confronts an unrepentant Dumah in Heaven. Dumah refuses Castiel access to Jack and threatens to end Mary and John's happiness in their shared Heaven with just a snap of her fingers. Enraged by Dumah's actions, Castiel draws his angel blade and kills her, ending Dumah's reign of terror and ensuring John and Mary's safety. After a brief glance down at her, Castiel leaves Dumah's body on the floor of Heaven as he runs off to find Jack. Dumah is the angel of silence and the stillness of death. He is said to lead tens of thousands of angels of destruction as well as the demons of Gehenna. 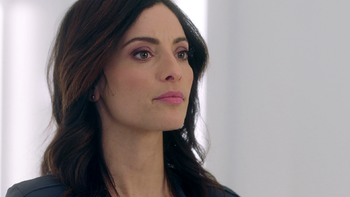 Erica Cerra previously played Robin in 6.22 The Man Who Knew Too Much. When Dumah is killed, she leaves no blood on Castiel's angel blade, possibly because she died in Heaven. This page was last edited on 20 April 2019, at 08:23.